We offer sales and professional installation of many different brands and types of pet doors and automatic dog doors. Through our online pet supplies store PetStuffWarehouse.com, we can now offer all the top brands of dog doors or cat doors. 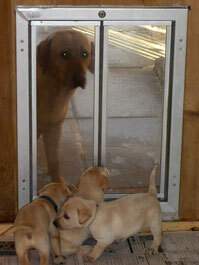 Custom sized pet doors and custom installations (through windows, walls, patio doors) are available. We are authorized Plexidor®, Patio Pacific®, and Hale® dealers. If your installation requires a Custom-Built pet door, we can do that too. Or we'll install a pet door you have already purchased. Just contact us for a specialized consultation. Older pets don’t like to use pet doors that are uncomfortable. Make sure you get a door that your pet will always be able to use. Don't get the absolute smallest pet door he can barely squeeze through. Give him a little elbow room. If you currently have a kitten or puppy, remember that they will grow more quickly than you might expect. Mount the pet door so that it is low enough for your pet to comfortably step over. Young pets can raise their legs up to their chest but older pets may have trouble with this. Make sure the pet door is tall enough for your pet. Hunching over can be hard on your pet’s hips, especially as they age. And the flaps on your door will last longer if your pet isn’t rubbing against the top of the door as he passes through. If you're planning to use more than one pet door it's a good idea to have them all use the same type of flap, if possible, for greater consistency. Don’t forget that your pet needs access from both sides of your pet door. If you are installing the door in an area that has steps outside, please take into consideration how your pet will have to get through the door.